A Liberal's Libretto: Another Favorite Clip: 650 singers, the Hallelujah Chorus and Macy's. Another Favorite Clip: 650 singers, the Hallelujah Chorus and Macy's. 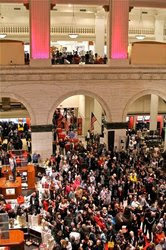 Last Saturday, the Opera Company of Philadelphia kicked off National Opera Week on a huge scale. Partnering with Macy's and the John S. & James L. Knight Foundation, the Opera Company of Philadelphia Chorus combined with other area choirs to produce one of the Knight Foundation's "Random Acts of Culture". That's right, Chiclets. 650 singers from the area, accompanied by the famed Wanamaker Organ - the world's largest pipe organ - surprised shoppers at the Center City Philadelphia Macy's with a spontaneous rendition of the Hallelujah Chorus from Handel's Messiah. This is true amazingness. So, without further word from Yours Truly, I give you the next installment of Another Favorite Clip. Enjoy! That was wonderful! It gave me chills just watching - so beautiful and the crowd was really into it. I love the Hallelujah Chorus. It's such a recognizable piece of music, too.